Since he first started draining the barrels that fill much of his Alphington brewery, Costa Nikias reckons he's released upwards of 20 different barrel aged beers. There have been spontaneous ferments, dark ales, fruit blends and more besides. Yet he'd never released a version of his flagship beer, the original Saison (albeit a beer that has evolved organically since its origin), that had spent time on oak. That's been remedied for spring 2018, with the release of Reserve Saison, a blend of beers that had been sitting in barriques and hogsheads from Burgundy since 2015 and 2016. 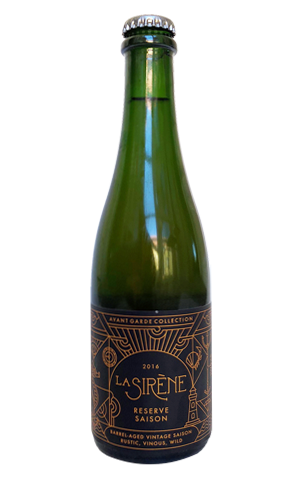 And it's a beer that, in a way, tells the story of La Sirène in recent years, opening up with oak characters – vanillin and a little nutty – before the funkier elements that have been infiltrating the house yeast and enveloping the brewery step up to the plate. There's hay like Bretty characters in there and a lively yet broad acidity too, with the potency of its funkier elements building as it warms. Some of the citrusy character of the original beer remains, but much more is layered on top, taking the beer to a new place, just as Costa and his team is doing with the brewery as a whole.